This essay tentatively integrates the analysis of macroeconomic processes with that of natural ecological systems via energy balances and calculations. On the one hand, entropy studies concerning ecology and economy by Tsuchida (1976), Tamanoi, Tsuchida & Murota (1984), Murota (1984, 1985, 1987), Tsuchida & Murota (1985), and Kawamiya (1985) have stressed the major importance of the water cycle, wind energy, and the topsoil function as the hidden keys to the earth's open steady state and the renewability of its living systems. Proceedings - The European steel technology platform’s strategic research agenda vision for the sustainable steel production 2030s. 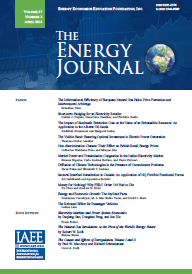 Published in Volume 9, Number 1 of The Quarterly Journal of the IAEE's Energy Economics Education Foundation.